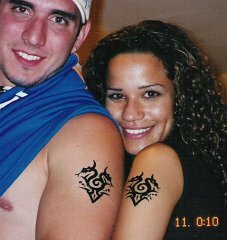 We offer 2 versions of temporary tattoo paste. Classic red henna and dark blue paste based on Jagua. Red henna is mixed with natural lemon juice and organic aromatic oils to strengthen the color. It is suitable for traditional oriental events, like weddings bridal parties or individual henna lovers and designs usually focus on traditional patterns (see Photo Gallery section). We use strictly natural henna and organic aromatic oils for our henna paste. No chemical additives or color dyes. Dark blue paste is based on extract from Jagua tropical plant. We also mix it with organic aromatic oils to strengthen the color. It takes 24 hours to develop and finnal result is dark blue tatto that is unrecognizable from permanent unicolored tattoes. They are 100% natural, painless and temporary. 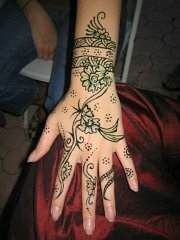 I specialize in contemporary designs, belly henna, bridal henna, tribal designs and more. 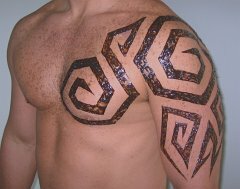 I have the traditional red/brown colored henna, or a dark tattoo colored ink called Jagua. 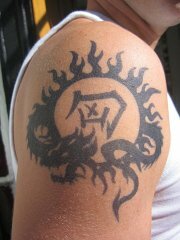 Many of my clients like to try out tattoo designs before they get them for real. Henna and Jagua generally last about 2 weeks. Email or call me to discuss your design ideas! Private appointments are available in the South Beach area, and they are by appointment only. Pricing is $100 for a 45 minute appointment. 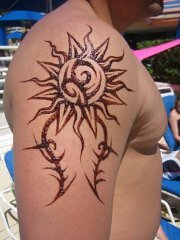 For this price I will do henna on one person, or a small group for 45 minutes. Feel free to bring your own design, or we can create one together. Events that are longer than 5 hours: call for discount pricing. Travel fee may apply depending on your area. I am based in the South Beach area but travel all to all Miami Dade and Broward areas. Deposit: We require a non-refundable deposit to secure a booking. In the event of a cancelation, you may use the deposit amount towards a future booking, there are no deposit refunds. Deposits for Party Planners and event companies may be waived, call for more information (305)801-8601.